The EU's chief negotiator Michel Barnier has warned that "Brexit is not a game" after being asked whose court he thought "the ball is in". 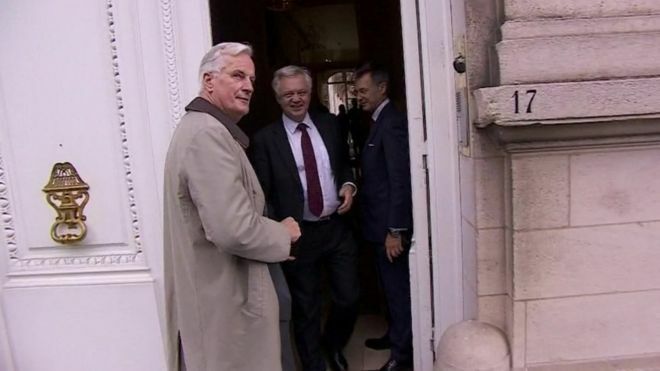 He was speaking to the BBC after a "good" and "constructive" working lunch with the UK's Brexit Secretary David Davis as negotiations continue. Next week EU leaders decide if enough progress has been made to move talks on to the UK's future trade relations. The UK is set to leave the European Union at the end of March 2019. Both EU and UK teams have said the ball is in the other side's court this week - implying that it is the other side that has to make the next concession. This week's talks came as ministers sought to ease disquiet among Brexit-backing MPs about the UK's strategy for a two year "transition" period between being a full EU member and the UK's eventual post-Brexit relations with the EU. Downing Street said it wanted the process to be "as smooth as possible".